ed Quay Aluminum "exact fit" Rear Spoilers are manufactured to fit your vehicle without alteration. Most have a 4" section on the deck lid (for mounting purposes) and extend 11" rearward. All are built for a specific year, make and model of car or truck. We have over 100 patterns for Ford, GM and Mopar vehicles. Our availability list (*NOTE: The availability list is in PDF format) is always growing so if you don't see your vehicle listed e-mail us or give us a call, we'll do our best to build one just for you. 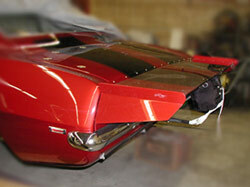 We also build custom spoilers per customer request, ask us! Our spoilers are all "exact fit", they can be purchased without support strut rods or with adjustable strut rod assemblies for those that want the "Pro Stock" look. We recommend strut rods for strength and minimum deflection. They feature .050 doubled aluminum end plates for strength and durability and the .040 center section has a doubled 1/2" lip at the back for strength and increased downforce.Stainless steel hardware is included. The spoilers can be (customer) polished, painted or installed as manufactured depending on your desires.